We constantly hear stories of huge marketing campaigns from go-to brands like Coca Cola or Bud Light. Whether it’s a viral Super Bowl commercial or influencer marketing campaign involving A-list celebrities, every marketer can’t help but take note from the greats. 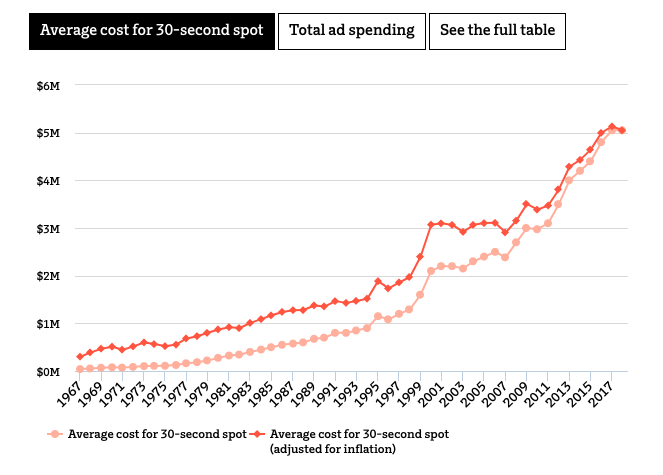 However, not every brand has $4 million to shell out on a 30-second ad. That’s why social media has become the “great equalizer” for marketers. With platforms like Facebook, Twitter and Instagram, you don’t need millions of dollars to run a successful marketing campaign. You just have to be creative and know your audience. It’s no longer just about the size of your budget. Now it’s all about how you spend those marketing dollars. 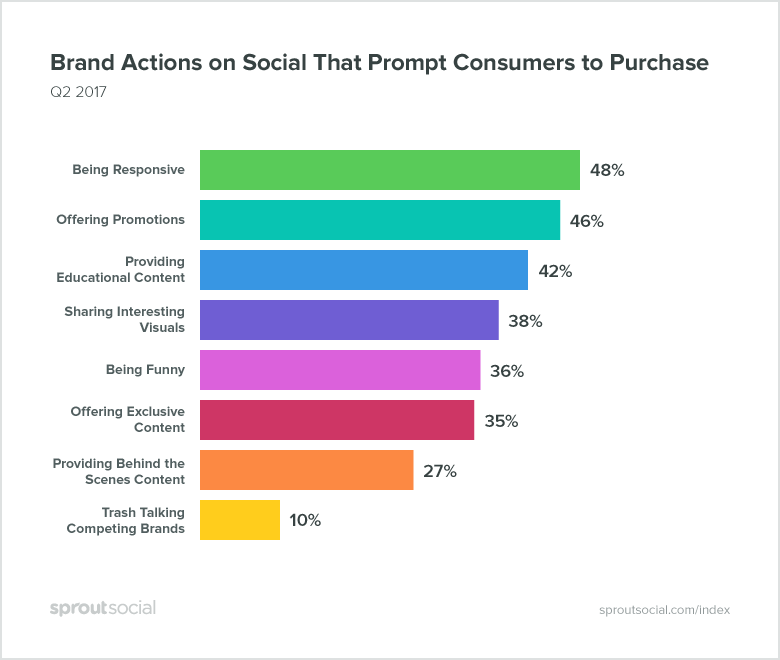 Even brands that do have millions to spend have turned to social media to get more bang for their buck. But again, it all comes down to strategy and execution. Without good ideas and a plan to put them into action, you’ll fall flat. If you’re short on ideas, don’t worry. Sometimes we all just need a little inspiration to know what’s possible. We’ve compiled a list of eight amazing social media marketing examples from 2018. We’ll show you campaigns from smaller brands that likely don’t have the same size budget as larger competitors but still manage to make noise. Plus, we’ll look at some larger more established brands to show how they’ve adapted to the new social media wave. The point is, whether your budget is $1,000 or $1 million, you can use social media to grow your brand. The cell phone case industry is extremely competitive. Pretty much anyone can buy cases in bulk from Alibaba and resell them for a markup. So when a company is able to stand out and establish a brand, you can’t help but take notice. 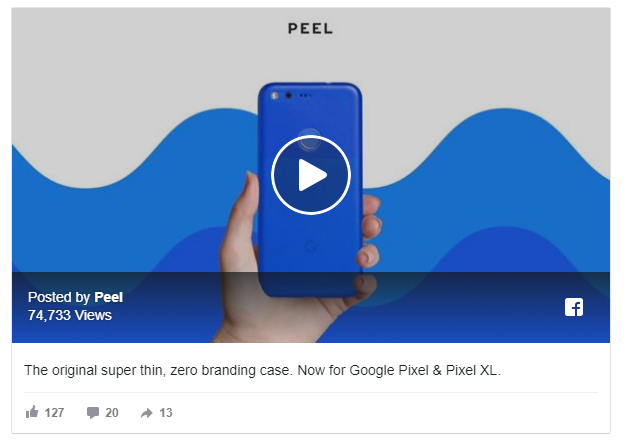 Peel sells thin phone cases, with the major selling point being they’re both functional and stylish. So naturally, social media is a great avenue to showcase their products. They use Facebook video ads to help tell the story of what separates their products from everyone else. The campaigns have been successful to say the least, resulting in a 16x increase in revenue and 3x higher ROI. Their success isn’t solely from ads though. 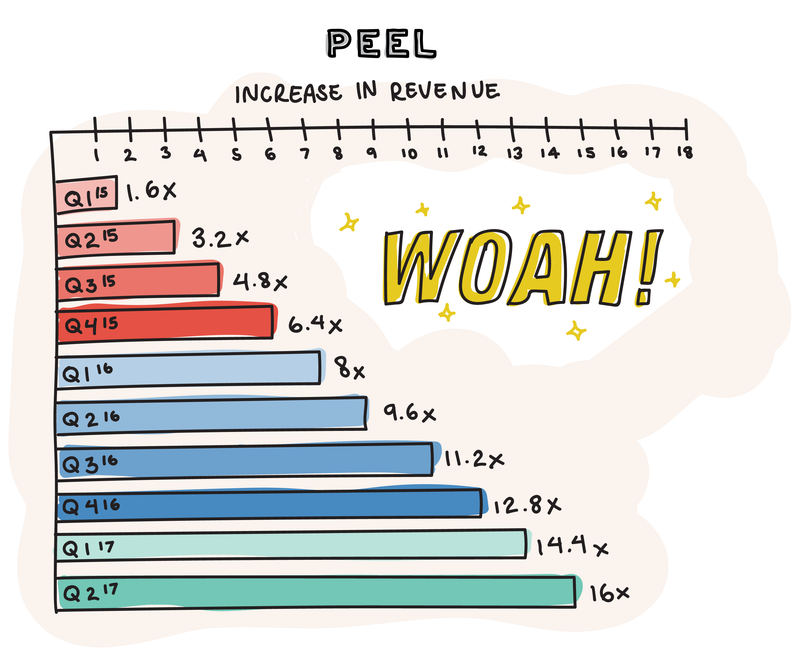 Peel is also a great example of how to succeed on organic social. 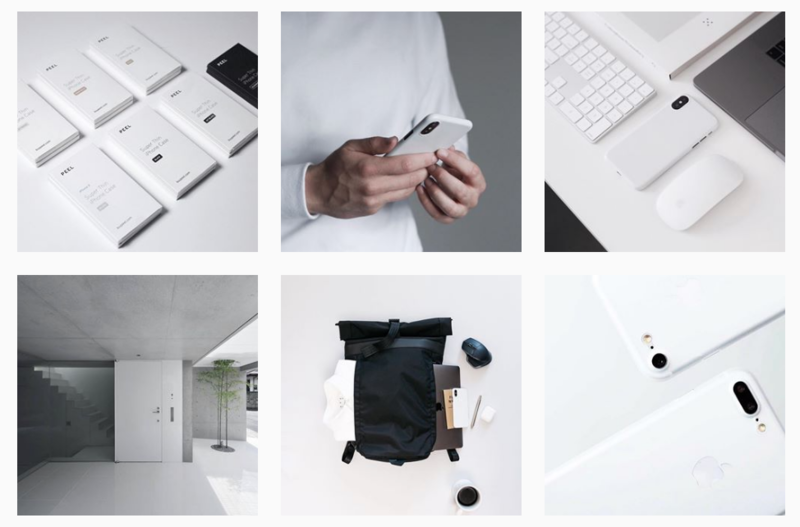 For instance, they have a very cohesive and visually appealing Instagram feed. That might not seem like the biggest deal in the world at first. But when one of your brand’s major selling points is aesthetics, little details like this help reinforce your messaging. Plus, people take notice. 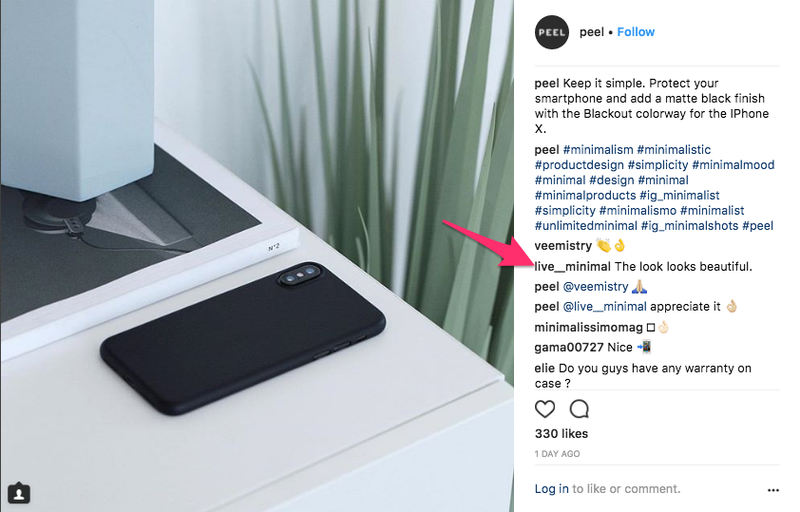 On top of that, you’ll notice Peel does a great job of responding to customers on Instagram. Providing excellent social customer care is crucial for any brand that wants to succeed on social. 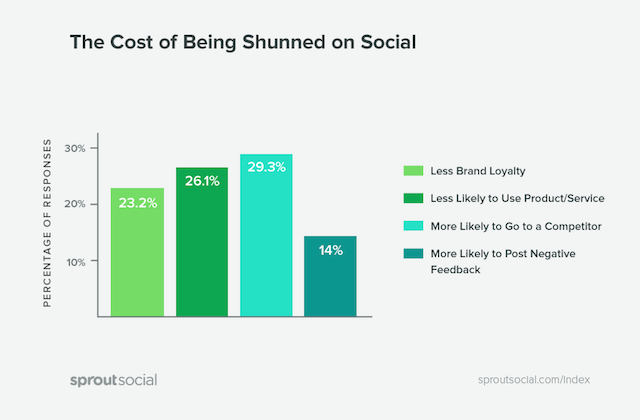 Our data found that 29% of consumers are more likely to go to a competitor if they’re ignored on social. So each comment you miss is potentially lost revenue. The larger your brand becomes, the more difficult it’ll be to manage all your incoming comments across Facebook, Twitter and Instagram. In order to keep your sanity and avoid missing questions from customers, use Sprout’s Smart Inbox to get all your comments and messages in one place. Think of ways to set your brand apart on social media, especially in a competitive industry. Experiment with social media advertising. Use social media to reinforce your brand messaging and story. Our next social media marketing example comes from Wayfair. The online retailer is known for selling affordable furniture and home goods. As you can imagine, a large chunk of their audience is active on Instagram. For years, one of the biggest challenges for retailers on Instagram was getting followers to go from looking at a photo to going to their website and making a purchase. 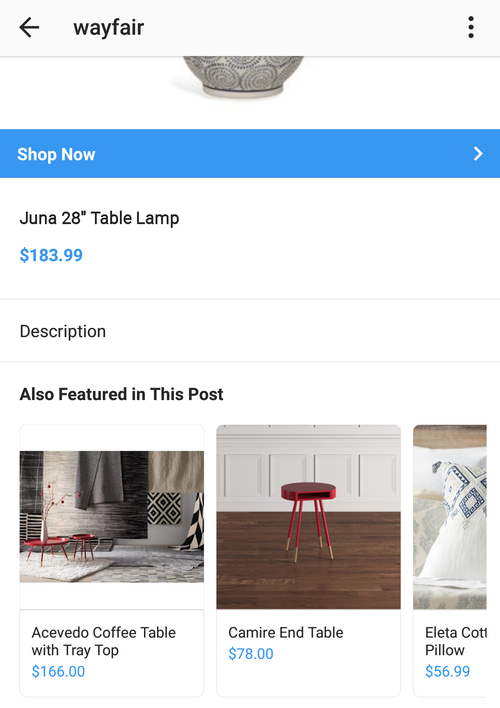 That changed in 2017 when Instagram rolled out new shopping features. 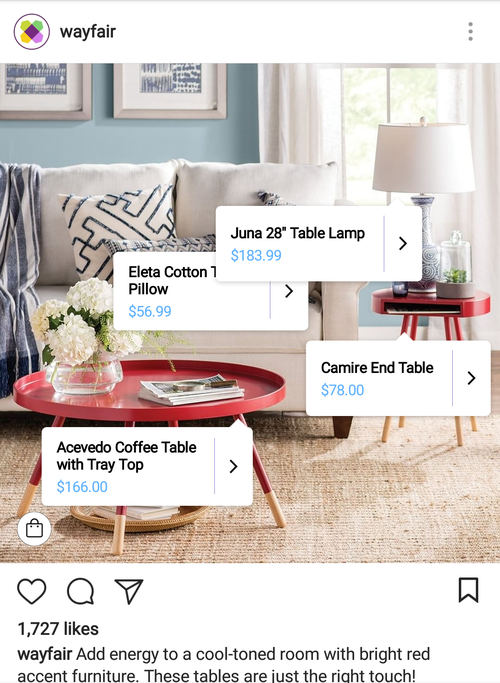 Through Instagram shopping, brands have the ability to tag specific products within a picture so users can go directly to a landing page and buy it. Wayfair has done a great job of implementing this feature into their social media strategy. Here’s an example of what the process looks like. First, you see a post that looks visually appealing. Shoppable posts are signified with the little shopping bag icon in the corner of the photo. When you tap the icon, all the shoppable products will pop up. Let’s say we’re interested in the table lamp. Just tap the box and you’re taken to a landing page on Instagram. If you scroll down a bit, you’ll also see the other shoppable products from the post. 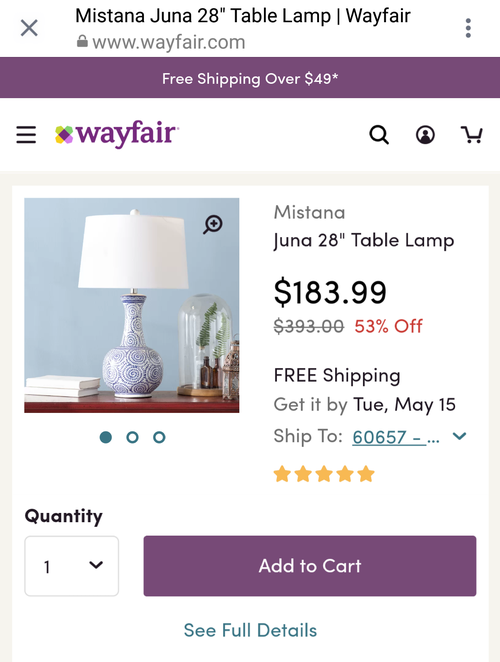 When you decide you want to make a purchase, tap Shop Now and you’re sent directly to the page on Wayfair’s site to buy the lamp. The process is smooth and caters to how consumers shop today, which is why it’s so effective. 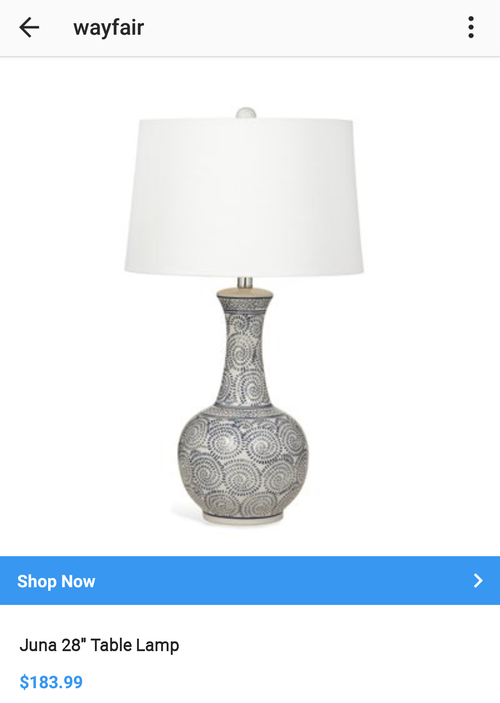 For example, what if instead of showing the lamp in a living room setting, Wayfair just used a photo of the lamp against a white background. It wouldn’t be nearly as appealing, and it would’ve been much less helpful for their audience. When you think about furniture, for example, you want to be able to see the product by itself, but also see it in an environment, and potentially in different styles. The team at Wayfair understands that just posting any ol’ type of content isn’t going to work. They purposefully share content that’s going to shed the best light on their products and appeal to their target audience. Don’t be afraid to use new features of different social networks. For retailers, give customers a seamless shopping experience from social media all the way through to checkout. Create content that fits the platform you’re using. Present your content and products in a way that’s easy for your audience to digest. This next social media marketing example is another retailer. Similar to Peel, they’re in a competitive industry—fashion. Wholesome Culture is a fashion brand aimed at people who live a plant-based lifestyle. The brand’s focus and mission is to make cruelty-free clothing while spreading the message of plant-based eating and helping the environment. While Wholesome Culture definitely isn’t the first brand to do this, we wanted to highlight them on our list because they’re doing a few things a lot of brands can (and should) learn from. One strategy they implement is posting content based on viral memes and pop culture trends. These posts often drive the most engagement for their page. In order to capitalize on the momentum they get from these posts, they typically sandwich them in between content that’s more directly related to the products they sell. Notice that they don’t just post random memes. They cater to Wholesome Culture’s audience and overall message of being animal friendly. The memes help attract the right audience, and hopefully people are intrigued enough to learn more about the brand behind the posts. Another tactic Wholesome Culture uses on Instagram is sharing short videos of vegan recipes. You might be wondering why a clothing brand would post recipe videos. Well, it comes down to knowing your audience and creating the type of content they want to see. Wholesome Culture’s audience consists of people on plant based diets. One of the biggest challenges of being a vegan is finding new and delicious recipes. Posting these recipe videos attracts new customers, helps current followers and boosts engagement. So there’s a ton of upside. One last thing we want to point out is the use of hashtags. As you likely know, hashtags are very popular on Instagram. However, there’s a difference between being strategic with hashtags and spamming. Wholesome Culture uses hashtags to get discovered by their targeted audience. 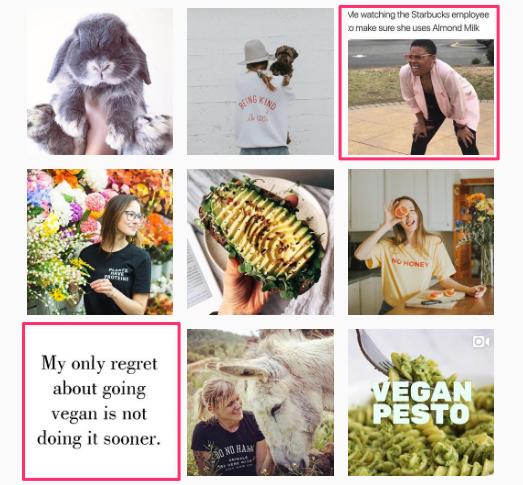 You’ll often see hashtags like #veganlife, #plantbased and #savetheworld in their posts. It’s because those are the hashtags their target audience is searching for on Instagram. By including them in their captions, they have a chance to show up in Instagram’s search results. Focus on building a community on social media, not just gaining followers. Use current pop-culture trends to pull in your audience. Integrate your brand’s messaging and core values in your social channels. The direct-to-consumer mattress industry has exploded over the past few years. It seems like a new brand pops up every week. One company that has been leading the charge, with the help of their social media strategy, is Casper. Casper injects humor into their marketing without being crude or inauthentic. Pulling off humor on social media is a tough challenge. In fact, only 36% of consumers are compelled to make a purchase due to brands being funny on social media. Casper found a way to pull it off though. Instead of making their content all about mattresses, they focus on the value their products bring—sleep. The reason this is so important is because unless you’re currently shopping for one, most people don’t care about mattresses. If all Casper’s content was about how to pick a mattress or the benefits of their products, it’d get stale very quickly. Plus they’d alienate a lot of people. Posts like the example above are relatable to a wide audience. Even if you don’t currently want a mattress, you’d still be compelled to follow Casper on social media because they share entertaining content around sleep. Another thing Casper does well is stay active. While they have different posting frequencies for each social media profile, you’ll be hard pressed to find a day where they don’t post on at least one of their accounts. In addition to staying active, it’s important to keep in mind that your audience likely doesn’t follow you on each social network. Some might follow you on Facebook while others follow you on Instagram or Twitter. In order to reach as many people as possible, take a page from Casper’s book and occasionally publish the same piece of content to each profile. With organic reach becoming an increasingly sought after commodity, publishing your top content to each platform is a good way to get in front of as much of your audience as possible. The easiest way to do that is with a social media management tool like Sprout Social. 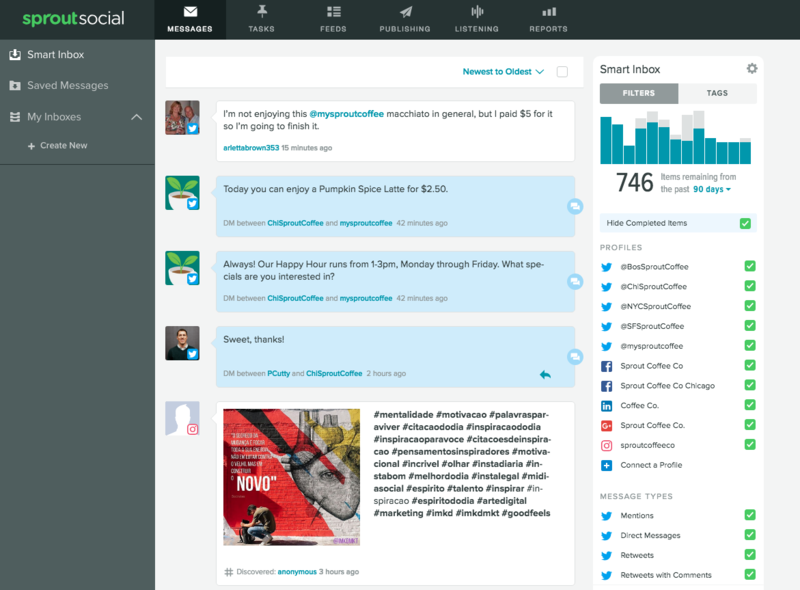 With Sprout, you can schedule social media posts to publish to different social networks with ease. Learn more about Sprout’s publishing features here. Come up with an angle for your content that’s evergreen and not all about your products. Use a social media calendar to share content to make sure you’re publishing content daily. Share content on all your social accounts to amplify your reach. Social media is one of the best ways to implement a user-generated content strategy. Not only does it encourage engagement, but it also makes it easy for your biggest advocates to show their appreciation of your brand to their audience. ASOS is a great example of a brand that does UGC very well with their #AsSeenOnMe campaign. The fashion brand asks followers to use the hashtag when they’re showing off their latest outfit from the retailer. In return, they have the opportunity to be featured on the ASOS Instagram feed which gives them plenty of exposure. 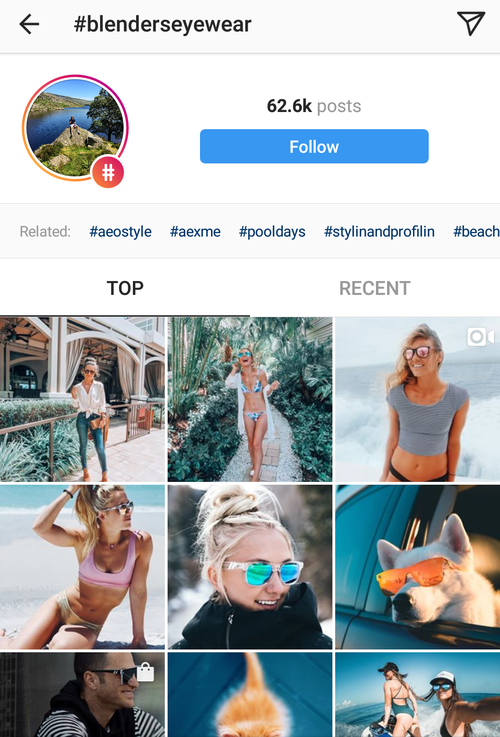 Not only does ASOS use this UGC to fill up their feed, but they also use it as an opportunity to promote the products people wear in the photos. Notice in the caption they include a description of the product as well as a number. That makes it easy for people to search and find the looks in the photos if they’re interested in buying them. On top of that, ASOS has a dedicated page on their website where people can easily shop the different looks featured in the #AsSeenOnMe. Since they’ve included a branded hashtag for the campaign, tracking the latest posts is simple. 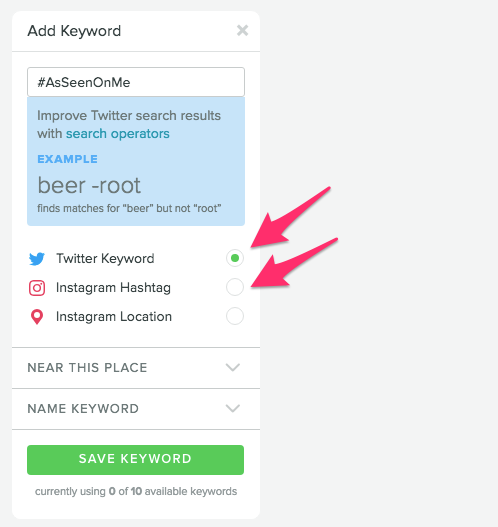 You can use Sprout Social’s monitoring tools to see all the posts tagged with your hashtag in one feed. 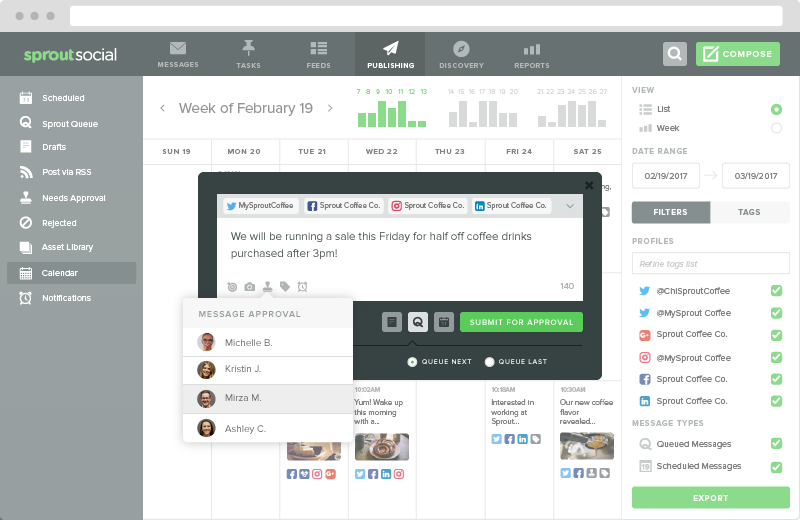 This is even more helpful when you’re running a UGC campaign on multiple channels. Another reason ASOS is on our list of the top social media marketing examples of 2018 is their use of influencer marketing. Instagram is one of the top platforms for influencer marketing, particularly for fashion brands. ASOS has an ASOS Insiders program, where they work with influencers to promote their latest products and styles. The ASOS Insiders are easily identifiable by their Instagram bios and handles. The stronger your relationship with influencers, the more effort they’ll put towards promoting your brand. Take note from ASOS and focus on building genuine relationships with the influencers you work with. Use UGC to get organic engagement and improve sales. Don’t forget to include a branded hashtag to track your UGC campaigns. Develop an influencer marketing strategy that focuses on building a community of advocates, not transactional relationships. Up to this point, the brands we’ve covered have been fairly “social media friendly.” But what if you’re in an industry that’s a little more taboo? People are more than happy to share photos of their newest outfit on Instagram, but how many are rushing to post videos discussing incontinence? That’s the challenge Tena faces, as they sell a line of products aimed at helping adults who experience incontinence. Their approach on social media is to showcase just how normal the condition is, as well as provide information on how to live with it. One of their latest social media marketing campaigns was made to promote their new My Pelvic Floor Fitness (pff) app. In order to spread the word, Tena created a video and social media contest. This is a great social media marketing example for a few reasons. For one, it focused on uniting women around an issue that many experience but few talk about. By normalizing the issues Tena’s products solve, it invites their target audience to feel safe and comfortable talking about it on Facebook. Another reason the contest works is because it encouraged fans to engage. People didn’t just have to enter in their email in order to participate. They were asked to post a selfie while doing the exercises featured in the app. So not only was it a fun way to enter the contest, but it also required minimal effort. Don’t be afraid to use social media, even if the products you sell aren’t “social media friendly”. Use social media as a way to unite your audience and create a safe space for them to interact. Run social media contests that encourage your target audience to engage with your brand. If you enjoy reading social media marketing case studies, there’s a strong chance you’ve come across the story of Blenders Eyewear at least once or twice. 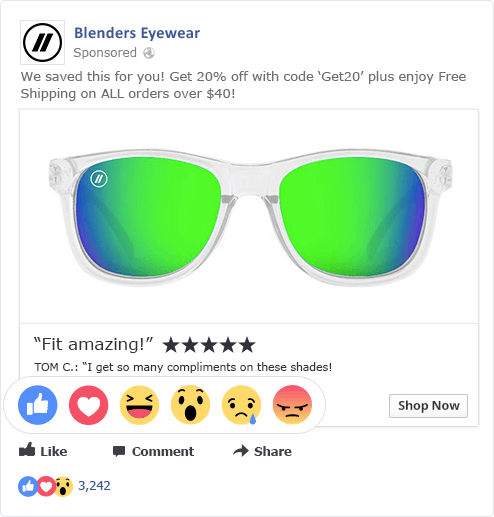 The sunglasses brand was basically built through a combination of Facebook Ads and Instagram influencer marketing. They’ve used quite a few social media marketing tactics to go from being a couple guys selling sunglasses out their backpacks to a seven figure business with hundreds of thousands of followers. We could do an entire post analyzing Blender Eyewear’s strategy, but we’ll focus on just a few of the things they’re doing extremely well. First and foremost is the Facebook Advertising strategy the online retailer used to increase return on ad spend by 62% and double their click through rate (CTR). Rather than go the same route as a lot of e-commerce brands and hard-selling their products with ads, Blenders let their audience to the talking. They created ads that highlighted customer reviews and comments about their products instead. The combination of customer feedback and visible engagement provided enough social proof to entice people to click. Not only were they able to achieve a higher CTR, but the new approach decreased their cost per click (CPC) by 40%. Blender’s success wasn’t solely from Facebook Ads though. A huge part of their growth is Instagram. When you scroll through their Instagram feed, you’ll see plenty of photos and videos of people wearing their shades. But they aren’t paid models. Blenders uses UGC to help fill up their Instagram feed with high quality photos taken by other people. I would show up in Ocean Beach and I would bounce around San Diego and just meet new photographers and bring a box of sunglasses. Just say, “Hey guys, I’m Chase. I’ve got a sunglass company. I follow all you guys already. Your photos are amazing. I would love to give you guys awesome pairs to photograph. If you guys would be so kind, send them to my email and I would love to share them and post about them on Instagram too. So instead of strictly trying to get high-priced influencers to work with them, Blenders builds relationships with photographers by sponsoring Instameets and offering free products. In addition to the photographers, Blenders also has plenty of satisfied customers who post photos on Instagram with the branded hashtag included in their bio. The hashtag has been used in over 60K posts, so it’s clear the brand has built up a very engaged audience. Include social proof in your Facebook ads to entice people to click. Embrace the Instagram community online and offline. Build relationships with non-traditional influencers. Encourage fans and customers to use your branded hashtag to get UGC and boost engagement. GE is the perfect example of a huge established brand that has really embraced social media. The fact that they’ve been around for decades and are still be a topic of conversation says it all. When we think of GE’s social media marketing, the first thing that comes to mind is video. GE has been absolutely killing it with Facebook video marketing in particular. Facebook averages over 8 billion video views every day so it’s easy to understand why so many brands are investing in it. The interesting thing with GE though, is the way they use video. While a lot of people are familiar with GE’s home appliances, the company does much more than make microwaves and refrigerators. They’re able to use videos to showcase some of the other technological innovations they’re working on as well as educate their audience. Their video marketing doesn’t just stop at Facebook. This year, GE released a series of videos on YouTube highlighting the work of their employees. The videos act as a way to further educate the public about some of the lesser-known work the company does, as well as attract high quality talent that wants to join in. So often, marketers look at social media as a way to sell more products or generate leads. GE proves the value of social media goes far beyond being transactional. It’s ultimately about branding, building awareness and telling a compelling story about your brand. Use social media to tell your brand’s story, not just to get new leads. If you haven’t started using videos yet, now’s the time. In order to stay around long term, embrace new marketing technology and use it to your advantage. This was just a short list of brands doing amazing things on social media in 2018, but hopefully they’ve got your creative juices flowing. The beauty of social media marketing is it’s accessible to businesses of any size and stage. Small companies just starting out can take notes from how Blenders Eyewear really pounded the pavement with Instagram to build their brand. Larger brands that have been around for a while can follow in the footsteps of Wayfair and experiment with new social media features. 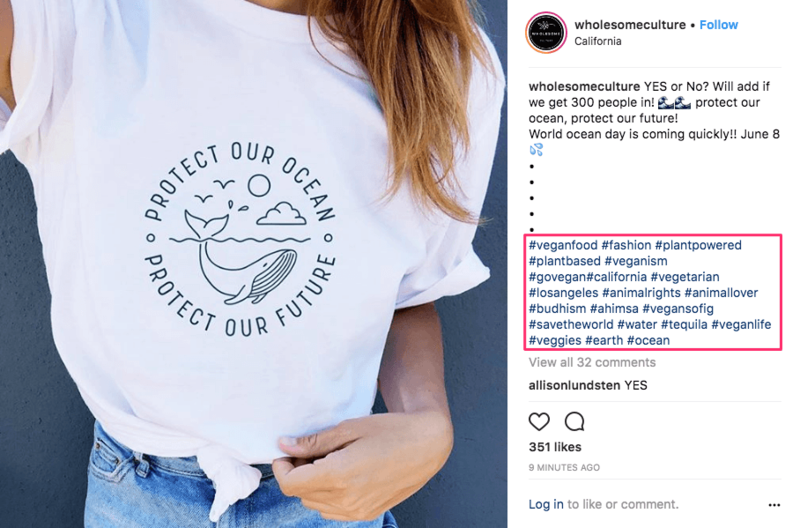 Use these social media marketing examples as inspiration for your next campaign, or for confirmation that you’re heading in the right direction.